I’ve done it before, and with my compulsive streak, will probably do it again. I came out of Central Station the other Saturday morning on my way to life drawing and looked up the street into the light and took a couple of photos of a fairly empty Bold Street. This time I think I got the greyness and feel with some loose washes of blues purples and greys. There is a sense of tired resignation at this hour with the inhabitants dragging their reluctant shadow along towards a shot of caffeine. I did this on white paper and so dont have patches of undercolour showing through. 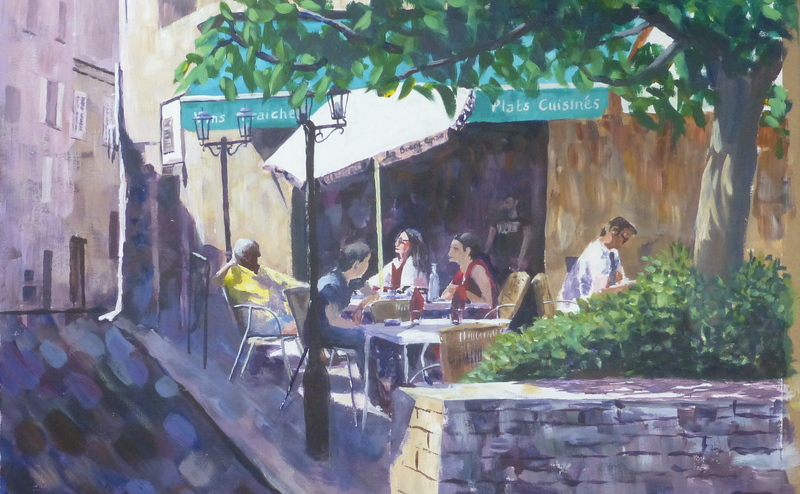 The guy in yellow with his hand behind his head, half in and out of shadow, attracted me at first, but as a worked, his dining companion, the lady with the sunglasses, took over as the focal point. I am not sure whether a unifying undercolour might help here. It seemed to make it more laborious covering all the surface with paint rather than being able to leave slivers of another colour. I also had concerns over the large areas of shadow and the rather crudely painted roadway, but I will give it some space and look at it again later. 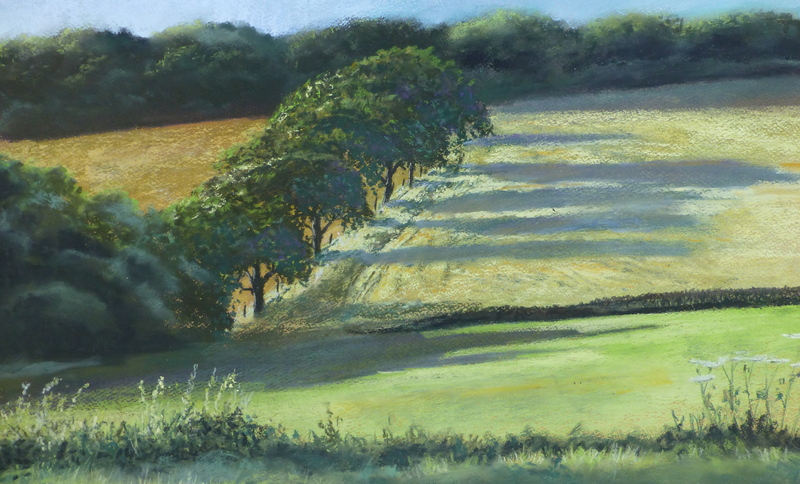 With acrylics reworking areas are very straightforward. I went out the other evening to do some painting. I went out to some hills to the east of Southport. After painting the view I rode around the top of the hill and took some photos in the evening light. This was the lane that runs up and over the hill. It was a route I took when I went to work, either by car or cycle. 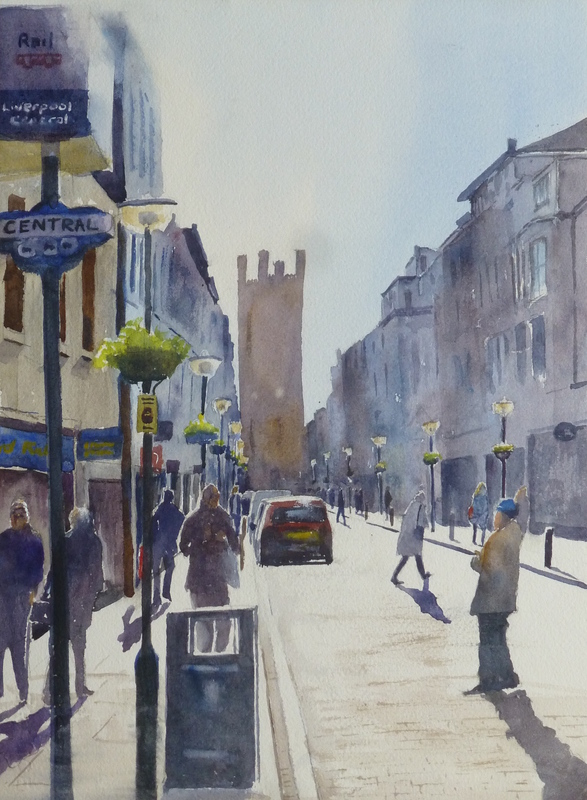 I liked the grouping of the buildings with the evening light coming in from the left. 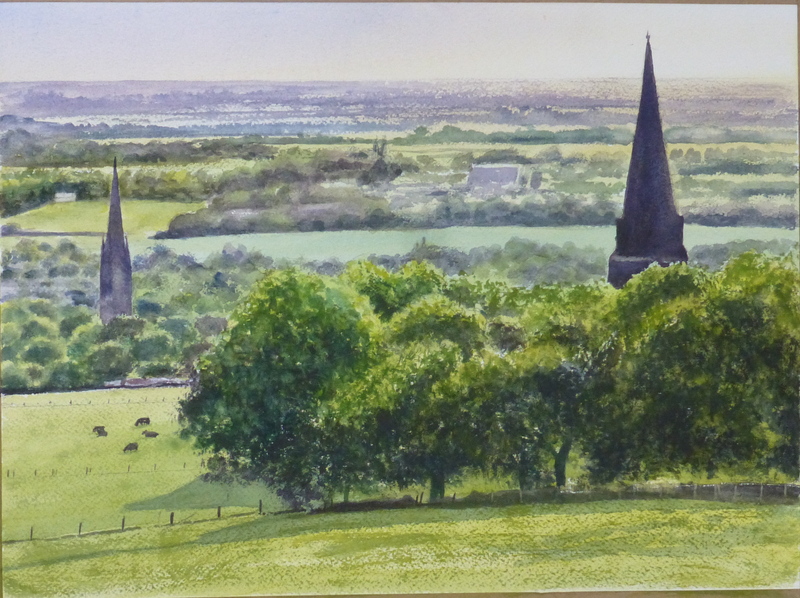 I have painted many other buildings in the vicinity as well as views from the hills. It’s a good place to paint. On 30th May, I posted several watercolour sketches of Corsica, one of which was done in the lovely port of St Florent in northern Corsica. 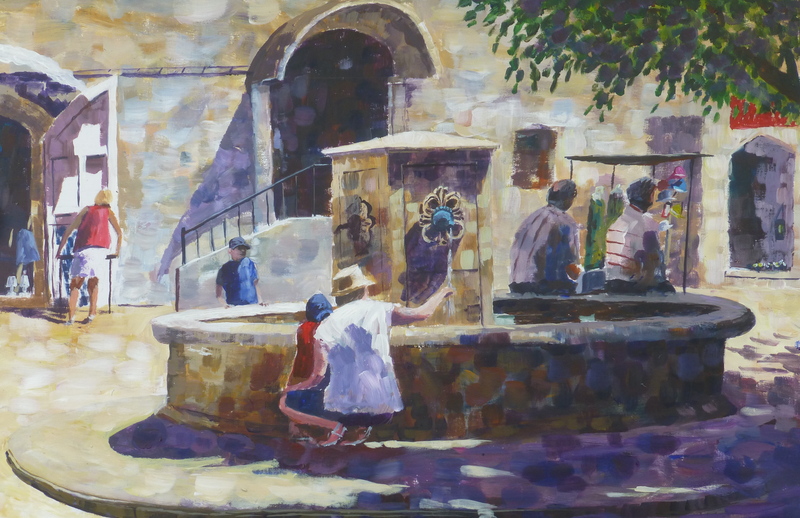 I was painting close to this fountain, in the shade myself, painting another part of the square. A number of people came to the fountain and they made some interesting groupings. I took some photos as I waited for my paint to dry and I decided to combine a number of the photos to give me this composite view. 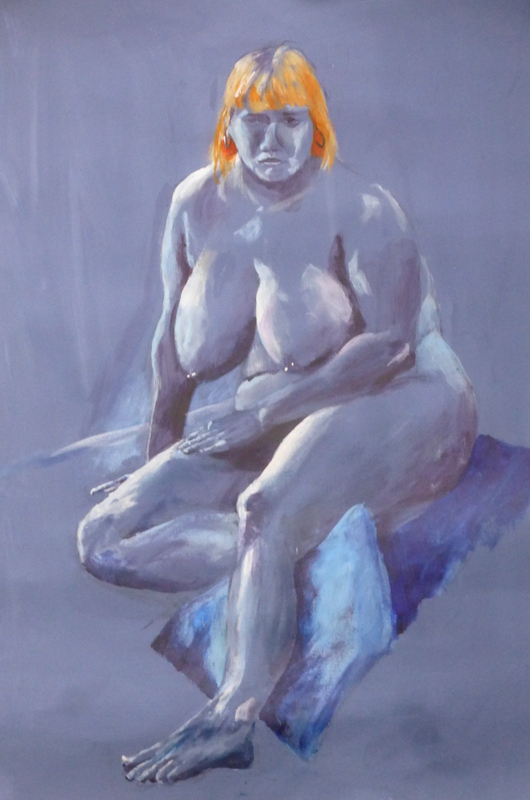 I prepared some paper with a blue/grey paint for a mid-tone background and took it to the life drawing group yesterday. I wanted to do a very simple painting with just a couple of tones but then this girl with dyed orange hair turned up to model. Her hair provided a bright complementary to the background although I stayed with just three tones for the rest of the painting.